The Electronic Flight Bag (EFB) has evolved over the last 20 years from a complicated cumbersome addition to the cockpit to a device essential to the contemporary pilot. The EFB is a device that allows flight crews to perform a variety of functions that were traditionally accomplished by using paper documents. The EFB can perform weight and balance calculations, digital flight log applications, and display a variety of digital documentation, including navigational charts, operations manuals, and aircraft checklists. With a Class 1 EFB, such as an iPad, pilots can have at their finger tips some of the most important data available. For a pilot utilizing paper charts it is essential that they prepare their flight with not only the planned charts for departure and arrival but their alternates as well. With an electronic flight bag the pilots can access not only the minimum charts needed but also any other chart that may have been forgotten. Operators can obtain authorization to utilize the EFB for weight and balance calculations and runway analysis using apps such as APG. 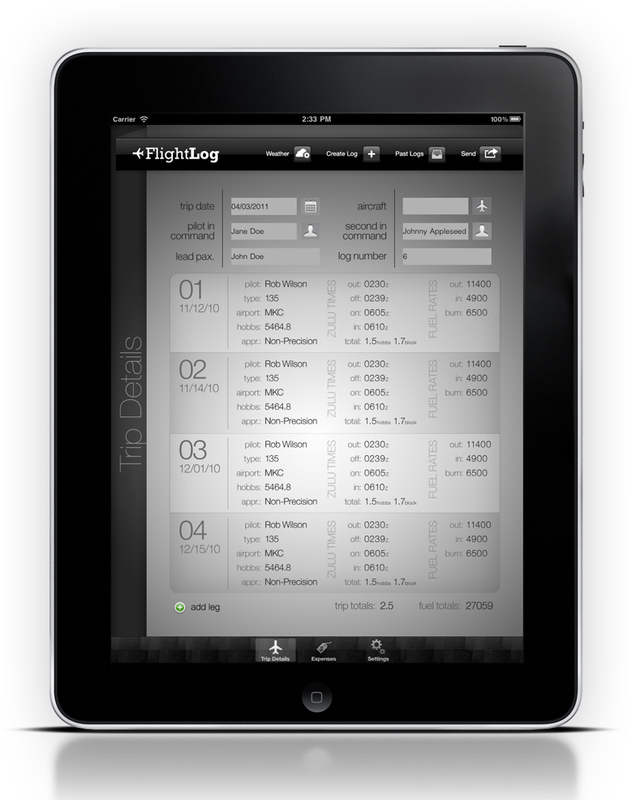 Want to transition from paper flight logs to digital? Not a problem, there is an app for that. Desert Jet created an app that allows pilots to track all items normally found on a traditional paper log, such as leg details, aircraft and engine times and cycles, and expenses, on the iPad. Want to have your flight plans available in digital form and accessible with weather? Not a problem, fltplan.com has an app for that, too. When pilots need to quickly find information in the MEL or Minimum Equipment List, they can run a search in the approved PDF reader. All of this is accessible on one device, increasing storage space and reducing weight of items carried on the aircraft. Electronic flight bags have been around for years now, but only recently did the iPad make it a capable and indispensable addition to the aircraft. Desert Jet now uses the iPad in the cockpit in place of paper documentation, increasing efficiency while preserving resources.